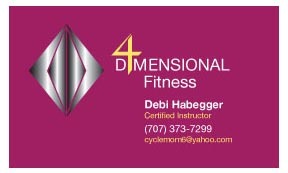 Logo and business card for a Fitness Instructor specializing in Pilates. We both wanted an image that suggested movement and stability at the same time. The gradient effects provide the image with a lot of depth. I was really happy the Client wasn’t afraid to go bold with color. 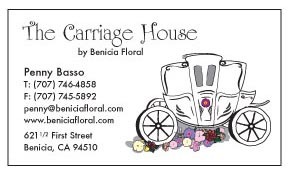 The Carriage House was to be a subsidiary of Benicia Floral, a separate location where future brides can go to view the variety of floral arrangements available for every aspect of their wedding. The Client specifically wanted a carriage and a playful use of type. The type is from two different fonts to avoid being so “playful” that you couldn’t read it easily. I drew the carriage by hand and traced it in the computer so it would hold up in print, but have a hand drawn look. I also designed a building sign and sandwich board to match. 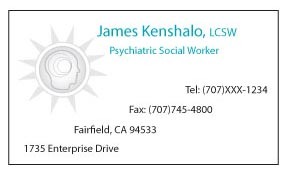 Logo and business card for a Psychiatric Social Worker. I wanted to represent that this is part of a path to mental health, so I placed a representation of the human mind over an image of the sun and stagger/stacked the information. Letterhead and envelopes also designed to match. 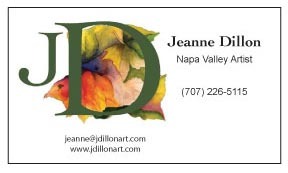 Logo and business card for a Napa Valley Artist. I used a piece of the artist’s own work as the backdrop to her initials to create a logo that represents her artwork and aesthetic taste. 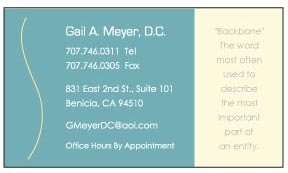 Logo and business card for a chiropractor. I wanted to represent the spine without actually depicting one. I also added the definition of the word “backbone” for added interest. 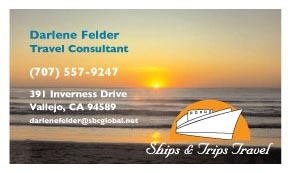 This travel agent already had business cards from a company that offers low cost design because you choose from one of their templates. The price is great but there is no flexibility. She liked the water background, but wanted to personalize the look. So we searched for just the right ocean photo, then I added semi-circle to suggest the sun, and a ship on top of that, with a nice friendly typeface.